Maximize your Investment Portfolio for Retirement to Meet your Retirement Income Needs. Generate Enough Retirement Income from your Investment Portfolio to Meet your Spending Needs and not Run out of Money. to travel to great places. 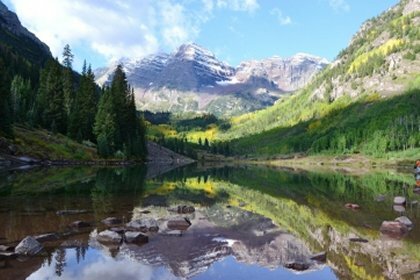 Aspen Colorado, Maroon Bells. Create and monitor a financial plan to guide you through the accumulation and distribution phases of your life. We offer a basic financial plan for the accumulation phase and a Money Guide Pro plan for the distribution phase. Seek out good financial advice to keep you on track and educated on financial planning, investments, strategy, performance analysis and act as a behavior coach during times of market volatility. Select a financial advisor with low fees and a strategy with strong performance. Example: 6.0% Portfolio performance – 0.7% Fee – 5.0% Benchmark = +0.3% AFA. A portfolio performing above its benchmark with lower investment advisor fees will produce a significantly larger retirement portfolio over 30 years compared to a poor performing portfolio with higher advisor fees. A 1.0% difference in After Fee Alpha is significant over 30 years when expected returns for a moderate risk portfolio are around 6.0%. When comparing advisors consider portfolio management and the added value of a financial plan and financial investment advice. The Focused Growth Investor is our newsletter that covers our investment strategy. It is an outlook on the stock market, asset classes and mutual funds. Our goal is to be in the market at the right time, select the best sectors and asset allocation for the market conditions, then select the best mutual funds in each asset class. The newsletter also provides investor education. The Portfolio Performance Analysis Report is sent each quarter. The report contains market analysis, portfolio performance & analysis, investments, asset allocation, cash movements and management fees. Select an experienced Registered Investment Advisor (Fiduciary) with no disciplinary actions, fee-only structure, financial planning and portfolio design and portfolio management. Good communication skills, service, transparency, integrity and low-cost structure are also important. We are a Registered Investment Advisor that put clients’ interests before our own. We are an independent advisor that personally invests in our strategy along with our clients. Our model portfolio performance is reported and verified annually by an independent party. No commission products, no loaded mutual funds, no annuities, no complex life insurance products, no non-traded REITS and no high fee hedge funds. Each January we update our ADV2 SEC filing that is posted here and on the SEC website. Clients should always review their Investment Advisor and Firm Public Disclosure on the SEC website. Our website, www.fginvestor.com is not intended to offer investment advice and would only offer advice if registered in that state. The website is designed for product information and posting of the Focused Growth Investor newsletter and alerts to clients.